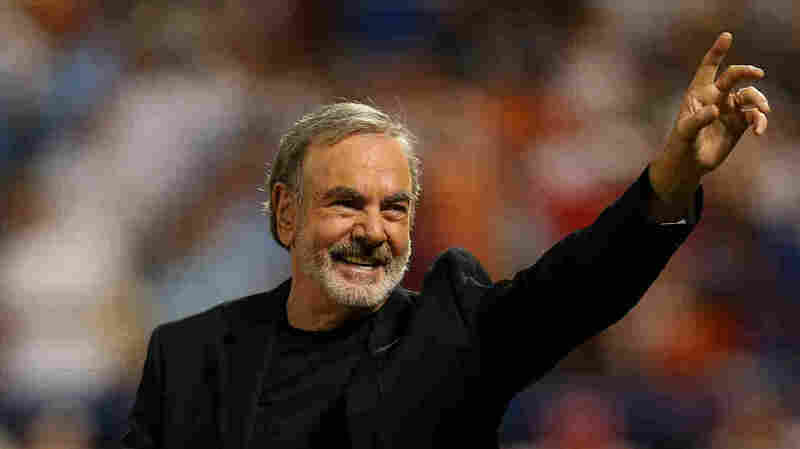 Neil Diamond Announces Retirement From Touring Following Parkinson's Diagnosis : The Record The sequined legend is giving up the road — doctor's orders. Diamond was on the cusp of finishing his 50th Anniversary World Tour. Neil Diamond performs during the 84th Major League Baseball All-Star Game on July 16, 2013 in New York. The singer announced his retirement from performing after being diagnosed with Parkinson's disease. Neil Diamond, the legendary troubadour reared on Tin Pan Alley, says he's retiring from touring after being diagnosed with Parkinson's disease. The announcement came yesterday, just eight dates shy of Diamond concluding his 50th Anniversary Tour. "It is with great reluctance and disappointment that I announce my retirement from concert touring," says Diamond in a prepared statement. "I have been so honored to bring my shows to the public for the past 50 years. My sincerest apologies to everyone who purchased tickets and were planning to come to the upcoming shows." Diamond says he'll continue to write and record music "for a long time to come." Diamond, now a Rock and Roll Hall of Fame inductee, began as a struggling, college-dropout songwriter before the (relatively mild) success of his song "Solitary Man" allowed him to begin cultivating a career as a solo performer. Diamond will receive the Lifetime Achievement Award at the Grammy Awards this Sunday. Part of Diamond's enduring appeal was his embrace of kitsch, including those famed sequined shirts shimmying in time to his unabashed dancing. It pointed to an earnestness, and obliviousness to trend, that helped sustain his popularity through the waxes and wanes of decades as an artist. His last studio album of originals, Melody Road, was released in October, 2014. "This ride has been 'so good, so good, so good,'" wrote Diamond in a winking nod to one of his greatest hits, "thanks to you."